$150 13’6”Lx11’Wx11’H Everybody likes golf because anyone can play. 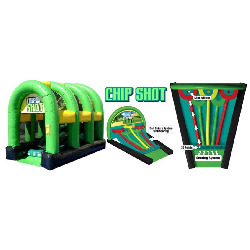 This unit includes clubs and balls, as well as the inflatable attraction. A suggestion is to have a competition throughout your event with prizes for the best scores. Even without the prizes, it’s lots of fun for your participants.